I always treated viewing SMART as something plenty of tools like PC Wizard have. Each time I needed to look at those numbers I had to dig for them inside of one or another utility that mostly does something else. I gave up and decided that having separate app is worth it to save some clicks and nerves. 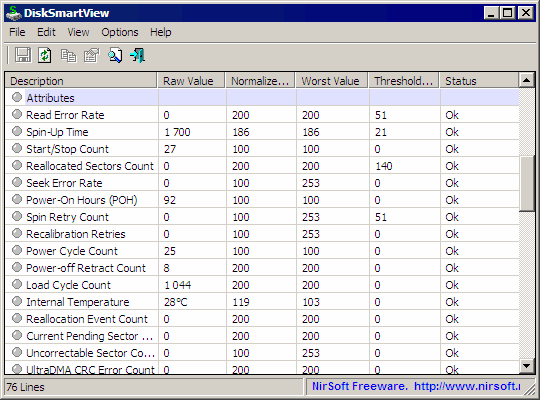 As it most often is, Nirsoft provides one – DiskSmartView that allows to quickly and efficiently see SMART for all drives in the system. On load app displays basic information (like model, serial number, transfer mode, etc) and detectable SMART parameters for all drives in the system. Parameters are evaluated to status. There are also indicators, that I assume go colorful on issues, but I had no chance so far to use it on faulty drive. There is not much to play with in displaying SMART parameters. What I like in this one is that temperature is properly converted to degrees, something many apps fail or don’t bother to do. It would really make sense to show general info for all drives in the system, but app limits itself to SMART-capable only. I keep joking about Nirsoft apps and columns, but this is seriously the case where form does content no good. Rows blend together. There are no drive letters in sight, so it is pain to figure out what is what. Fine for single drive, but no so much for anything more than that. Straightforward and natively portable app that lacks in interface department, but makes up for that in speed and simplicity. PS and I have to remind that bad SMART is trouble, but good SMART doesn’t mean there is no trouble. It is better that HD Tune (free version)? I don’t remember how are SMART functions in that one. That free version is limited and no longer developed – I hadn’t used it in a long time. develop the interface of this applet further. to have SMART predict an impending catastrophic failure ! In my view, SMART isn’t worth bothering with. Well, SMART is indeed not too good and predicting drive failures. But it has other uses, for example it logs drive uptime and related pretty well. Good to assess when is it time to replace drive or when selling used one.